*I have been truly overwhelmed by your response to my last post, "To Moms of One or Two Children". I read every one of your comments - here and on the Short Stop Facebook Page and I loved watching y'all encourage one another and share your stories and the struggles we all face together and you encouraged me as you encouraged one another. 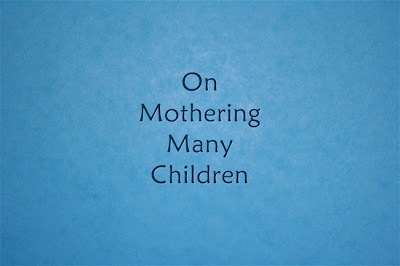 I wrote to mothers of one or two and I'm so glad it spoke to so many more of you. 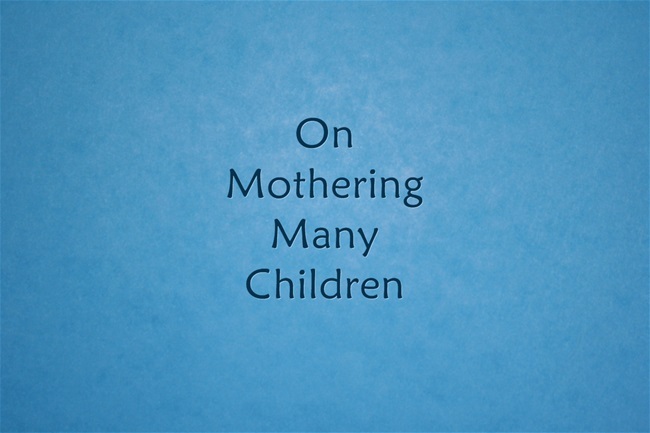 I'm now walking this equally crazy road with five littles trudging along behind me, so I thought I'd follow up with this post on mothering *many* children. I have come so far since I first became a mother - in so many different ways, but especially in learning to love where God has me. In the unique set of circumstances He's given to me and to love the hearts of my fellow Momma friends in the unique places God has placed them. I'm still maxed out and finding my way and asking God to get bigger in me. But, God has remained faithful and true and loving and He guides my steps now, just as He has since the day my first child was born. And, I'm so incredibly thankful for my party of five. *Originally published September 12, 2012. "Oh, this is my fifth", I responded with a smile as I patted my belly. "FIFTH? ", she gasped, her mouth dropping in a gawk of sorts. "Yes, my fifth. I am so excited." "Well, are you Catholic or something? ", she asked. "No", I gently responded. "I just always hoped for a big family." "Well, you're a better woman than I am", she continued. "I could never handle that many. Good luck to you." As the belt moved along and I stared at boxes of diapers, a large tub of peanut butter, a pack of Spiderman underpants, three gallons of milk, a red and black lace slinky number (I kid, I kid...) and the one-hundred plus dollars of "this is my life" that would soon fill up a cart's worth of red and white plastic bags that I'd lug up our front steps and into our house before collapsing on the sofa, I let out a small sigh. That one wasn't so bad. These exchanges - the ones between me and random strangers that I encounter out and about are part of my daily life these days. Some of them bother me more than others. Sometimes I’m happily surprised when a like-minded soul leans over and whispers, "Oh, how blessed you are." I am a mother of many. Or at least today's definition of many. And, I currently wear a round, little basketball out in front that announces: Oh, my. She's done it, again. Sometimes I wish I could wear my feelings for all to see - like I wear my growing baby. I don't mean the grumpiness I feel at relentless heartburn, or the elation I feel when I see a newborn in his mother's arms and know that I'll get to hold one of those precious little ones, again. I'm certain my face bears witness to those. I wish I could wear the reasons that I've chosen to have five children. I wish there was more time in a Target checkout line to tell of the joy and adventure and love that has permeated every area of my life because four precious little creatures came into my world and turned it upside down with Spiderman underpants and empty milk cups and heartburn. And, that just the thought of adding this next one to our family brings me to tears of joy. I wish I could express, to strangers and gawkers and whisperers, that I am not better or more qualified or less selfish or more of a woman because I have mothered a quiverful of children. Nor am I old-fashioned or Catholic or downright crazy. These children were born in my heart long before they were born from my body. And, along with that fulfilled hope has come sacrifice, long nights, an empty-ish bank account, fewer vacations, and less "stuff". But, it has been and is the greatest work I've ever done. And, while my family has its challenges - some unique to us, but most commonly shared by families big and small all over the world - we have each other. Through the good and the bad. In times of have and have not. Around our kitchen table and when we run out the door to this way and that. Yes, I am a mother of many children. I love this and your blog! I am a mom of 4, two of which are 2 1/2 yr old twins. I am proud and feel beyond blessed with our "big" family. It is so nice to have a kindred spirit. I am only 30 and I am content with my 4... for now! I have been having a small case of babyitus here and there. Nothing a visit with a new baby hasn't been able to cure yet! I usually don't have full blown babyitus until my children are potty trained...we forget how much ALL those diapers, wipes, and ointments cost! Love your blog, please keep sharing and encouraging us along. I remember being so blessed by these words the first time you wrote them- when I was 28 years old and pregnant with my fourth baby. The disparaging comments from strangers could be so disheartening (although the shocked looks were sometimes funny), and I still get them when I'm out and about with my "large" brood of four girls. Hubby and I were told by a passer-by a couple of weeks ago that its "time to stop" having babies! But you're right. They are gifts. They are wealth. And we are not crazy, just a little tired :) Thanks for using your gift with words and your insight to encourage others! Thank so much! I have three, and I have always wanted a BIG family, but some medical things, etc, etc, have really discouraged me as to whether it's worth it to keep trying. Thank you for reminding me that it is SO WORTH IT. For now I'll just be grateful for the three little gifts I already have. They certainly are the most precious gifts. Thank you, a million times over. This morning is my first baby's first birthday and your blog is such a treat to start the day off, remembering the way his life has completely changed our world. We too hope for a large family for many of the same reasons as you do. I remember the first time you posted this blog, I read it while nursing at some wee hour of the middle of the night as Jonathan became one month old and I was completely overwhelmed and thinking perhaps we needed to rethink our desire to have lots of babes. Your words came as a perfect encouragement then and continue to do so Sarah. Thank you for taking the time to write, sharing your life so openly and honestly, and saying everything so articulately that it speaks to my heart every time! Seriously though, you have written nearly the exact words on my heart. I am also carrying my fifth child and though exhausting, I feel it is the most valuable and rewarding work I have ever done (not the getting pregnant part ;-)... raising these beautiful gifts). So often moms complain about how they no longer have "me time." It is such a blessing to hear a mother praise her large family as the gift they are rather than the difficulties they present. And if I met you in public with your large brood, I would mention to you how blessed you are because children are a blessing from the Lord. The rewards are the joyful "Mommy"'s that occur when you emerge from your bedroom in the morning, the giggles, the dandelion bouquets, and the knowledge that to five little children YOU are the gift. You can't beat that! I just love, love, love this blog! There are so few of us running around today, we should have a club--but we're too busy and too exhausted. Each baby increases our ability to love. You do such a good job putting it into words. It's hard to describe how much each child adds. I've always wanted a big family, and I'm so thankful that God allowed me to mother 8 of his little children. The sacrifices don't even touch the blessings! I love how you get the link between God and motherhood! You're no slip-through-the-cracks kinda kid. Painful, unfamiliar, delightful, beautiful, surprising. Second Child unique, yet repeated; adjustments, guilt, pleasures, expanding heart-bulge. webs of interactions, intense longings, unbearable varicose infatuations, chaos, despair, ecstasy. You. The balloon which was the Heart of Mother stretched disproportionately with each new life. Threatened to burst, terribly resilient. self, stories, needs, hilarity, weaknesses, longings, challenges, blessings, trials. Each bringing a greater poignancy to the previous, adding to the design, packing in friendship, meaning. A stranger, uninformed, looking in might speculate. What's one little kid in a such a big family? Like marbles in a jar. Take one out, shake 'em up, no noticeable difference. Gold coins are only valuable in scarcity. You are a balance-block in our Jenga Tower. A steady ripple in our pond. Pull your thread, our pattern changes. Never the same beauty, something gone forever. If your link breaks, what of the chain? Beautiful! I am also a mother of five children. But they are mostly grown up now. I have a huge ache in my heart when I see a newborn baby and know it will never be my pleasure to have one of the precious ones again. If I could go back I would want to be more open to having more children. It is difficult and a lot of work and sacrifice, but it is SO WORTH IT! I encourage women to cherish the time you have with your children and accept all the GIFTS God is pleased to bless you with! Thanks for such wonderful descriptions of your journey. What is your denomination? I am so grateful for the faith in God you express through your posts. A wonderful follow up post! Thank you. I cried reading this because I am due with my 4th in about 2.5 months. I get the same questions. And while we are Catholic, it is not why we want a large family. I so relate to this, and wish all the nay-sayers and gawkers could read this.